LEFT: The skull of a complete specimen of Platecarpus tympaniticus (FHSM VP-322) found in 1950 by G. F. Sternberg in Gove County, KS. 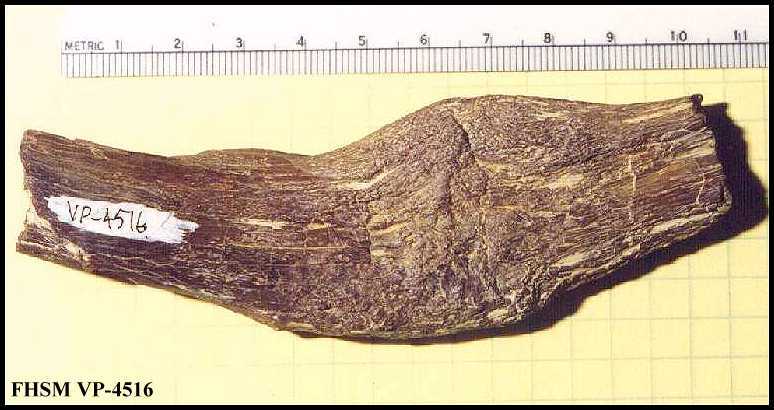 See more details of the numerous pathologies associated with this specimen HERE. 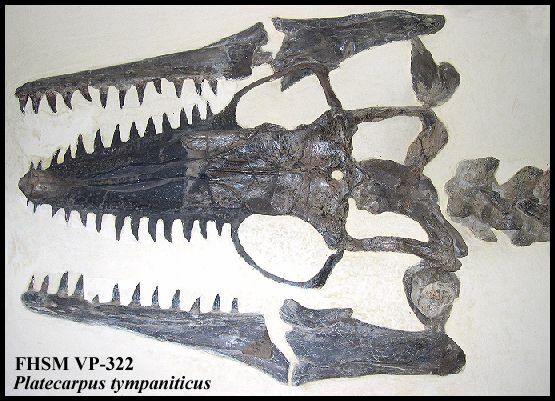 Wherein Charles H. Sternberg describes the genera of mosasaurs found in the Kansas chalk and the discovery of a well preserved specimen of Platecarpus tympaniticus Cope which he sent to the University of Iowa. See more about Charles H. Sternberg here. There are three well-defined genera of the Mosasaurs found in the chalk of western Kansas. The giant of his race, Tylosaurus, reached a length of nearly 50 feet. The next in point of size and power was the genus Platecarpus, with four broad paddles. The last is Clidastes, a smaller and more elegantly built reptile, with well developed additional articulations in the vertebral column, that enabled it to coil up like a serpent. All these reptiles had long conical heads terminating in a heavy, bony snout. In Platecarpus this is blunt, but in the other genera they are long and conical; and Cope believed they were used as a battering ram against their foes. A short neck of seven vertebræ characterizes all these reptiles; behind which were the scapular arches, from which were suspended the fore paddles, that consisted of the hands with five fingers, between which a membranous web was spread. They all had hind paddles attached to the pelvic arch, similar to the front ones, behind which was an elongated tail of many vertebræ that gradually decreased in size, so that the last one was a mere button, quite small, with no processes. They resembled both the snakes and lizards. Owing, however, to the presence of the limbs many paleontologists place them among the lizards. Hence the namea lizard of the river Meuse. Last year, while I was making one of my annual expeditions in search of fossil vertebrates in the chalk of Plum Creek, Grove [sic] County, Kan., my son George, a boy of 14 years, showed me three caudal vertebræ of a Platecarpus lying on a narrow ledge in a low wash in the yellow chalk. As the caps [cups] of the vertebræ pointed into a low mound, and, no fragments were protruding from the opposite ravine, the hope at once rose that I might be able to procure the whole skeleton, except, of course, the caudals that had been cut away by the wash along which those first seen were lying, in case the animal had died a natural death, and was not torn to pieces by the other voracious reptiles and fishes that so thickly patrolled the waters of his day, in search of food. few scattered bones torn from an animal by one who was fighting for his dinner, but was forced to drop it and fight another who also wanted it, and the consequence was it fell to the bottom of the sea. We find paddles here, skulls there. But a perfect skeleton is rare indeed. These great reptiles, fishes, birds and pterodactyls, lived during the age of reptiles, before the mammals with gentler instincts arrived on the stage of the worlds upward march towards higher and better types. They were all flesh-eaters and doubtless devoured their own offspring. The results of many battles I have seen in the broken ribs and other bones that have reunited. The most famous one I am familiar with is recorded in a Platecarpus discovered by Dr. Willistons expedition of last year, for the Kansas University. It was one with a whole scapular arch and part of the arm, that had been crushed so badly by the ram of an enemy that all the bones in healing had become so mixed and distorted that it was impossible to recognize the separate bones. With the hope mentioned we bravely attacked the mass of chalk that lay above the level of the bones. A fierce hot wind was parching the buffalo grass of the prairies, and howling through the canyons with remorseless fury, filling our eyes with fine dust that burned them like fresh slacked lime, and the sun with fervent beat was heating the naked chalk in the bit of bad lands in which the specimen lay, so hot we could hardly endure it. We labored for two weeks in taking out and packing this specimen. Owing to the curved position of the vertebral column, we had to lay bare a floor 9 x 16 feet. The average thickness of rock removed was about three feet of tough tenacious chalk that could only be chipped off little by little under the blows of our heavy picks. When very dry, however, our picks crushed into it like cutting into loaf sugar. When in this condition, water thrown on it causes it to effervesce, as if acid had been used. column had fallen apart, owing either to maceration in the water or the work of reptiles or fishes in search for food; fortunately they were but little disturbed, and the eye could easily see where each vertebra belonged.. The head was entire, except that the pterygoids and quadrates were a little out of place. The skull lay with top down, and the dentary bones were pressed down against the maxillaries, showing the teeth a little out of position. I took up six heavy slabs of chalk, which weighed about 1000 pounds. Some of the ribs and finger bones, and others, were either so far from the column or were in the way when I came to cut out the slabs, they had to be taken up separately. The whole specimen was sent to my laboratory in Lawrence, and there I spent a great deal of time in the difficult labor of brushing off the chalk so as to leave every bone in it original bed, standing up in relief. The result of my work left the skeleton, of which 15 feet was present, complete from the caudal region to end of snout. About ten feet of the tail was washed away. The separate bones mentioned were stuck to the rock, making, as I believe, the most perfect, or one of the most perfect specimens of this genus ever discovered. Credits: I am grateful to Carl Mehling of the American Museum of Natural History for supplying me with a copy of this article. Popular Science News (not to confused with Popular Science Monthly) was a short lived journal and is rarely found in libraries.